As if last weeks 80s hits flashbacks weren’t enough Carlsbad’s TGIF Concerts in The Parks goes back another decade to the softer side of the 70s flavor with the sounds of High Tide Society at Calavera Hills Park on Friday August 4, 2017. High Tide Society, formerly AM Gold, is keeping it classy and re-creating all of your 70s and early 80s soft-rock hits from artists like Ambrosia, America, Steely Dan, Kenny Loggins, Exile, Orleans, Air Supply, Little River Band, Toto, Hall & Oates, Christopher Cross and more. Remember to bring low-back chairs, snacks, and a little neon, hi-viz gear for full flavor. Show starts at 6 PM. Calavera Hills Park, is located at 2997 Glasgow Dr. at the corner of Carlsbad Village Drive. Shuttle service operates between 4:30 and 9 p.m. from Sage Creek High School (3900 Cannon Road). It’s difficult for many of us to get our heads around the fact that 80s hits are now technically golden oldies, but don’t let that stop you from getting your dancing shoes out for a rip roaring good time with The Spazmatics as Carlsbad’s TGIF Concerts In The Parks moves to Calavera Hills Park on Friday, July 28, 2017. All the awesome sounds, styles and way cool dance steps from the 1980s decade we’d love to forget. Complete with skinny ties, Brill Creamed hair and horn-rimmed glasses, The Spazmatics recapture all the best of the worst. Outstanding musicianship combined with creative flair and style makes for an evening of pure energy and entertainment. Elementary and middle school kids who love to dance, or aspire to try out for dance or cheer squads in the future, are invited to brush up on their dance skills this summer with the Carlsbad High School Varsity Dance Team. 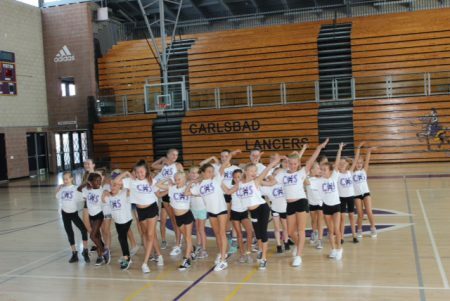 The 12-time National Champion Lancer Dancers will be holding a Junior Lancer Dancer summer camp from Aug. 15 through 18 at Carlsbad High School from 9 a.m. to noon each day. The team will be offering scholarships to qualified families to attend their Junior Lancer Dancer camp. Scholarships will be awarded based on HUD guidelines for low income families in San Diego County. Families that do not qualify can attend the summer camp for a donation of $125. For all the official details, please follow the jump. Don’t miss your last chance for music in Poinsettia Community Park on Friday July 21, 2017 as Carlsbad’s TGIF Concerts In The Parks presents the cajun sounds of Feufollet. Poinsettia Community Park is located 6600 Hidden Valley Road in Carlsbad, California. Parking shuttle service operates between 4:30 to 9 p.m. from North Coast Calvary Chapel, 1330 Poinsettia Lane. Got plans this Friday night? Sure you do. Carlsbad’s TGIF Concerts In The Parks hits up Poinsettia Community Park again on July 14, 2007 with some real deal, rocking’ soul with San Diego, California’s The Routine. Carlsbad’s TGIF Concerts in The Parks heads west this Friday, July 7, 2017 to Poinsettia Community Park with the Southern Fried sounds of Robert Jon & The Wreck. Robert Jon & The Wreck is quickly becoming a force to be reckoned with. Based out of Orange County, this quintet is dedicated, driven and committed to giving their fans a powerful rock and roll show – night after night and town after town. This team of follicular proficient troubadours isn’t slowing down anytime soon, recently releasing their sophomore album, Good Life Pie.